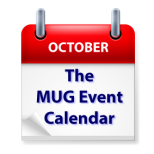 October draws to a close with several new topics on The MUG Event Calendar. A Canadian group will talk about the features of the Opera browser and a California creative pro group will examine reality TV and what it takes to put it on the air. An Apple Trivia competition will take place in Connecticut, and the broad market of note-taking applications will be the topic at a Washington D.C.-based group. Los Angeles Creative Pro User Group – "Reality TV Night." We welcome Vince Rocca who will be discussing his career path to reality television and he’ll be showing tips and tricks from the reality editing toolbox. Also joining us will be editors Shiran Amir, Renee Barron and Julie ‘Bob’ Lombardi. They will all be on the very first "panel" lacpug has ever done in 15 + years. The moderator will be Whitney Dunn. The intention here is to cover what you need to know to be a successful editor in Reality TV. Connecticut Mac Connection – Apple Trivia Contest!